I spent the afternoon flicking my wrists trying to dislodge fragments of fabric from my finger ends. 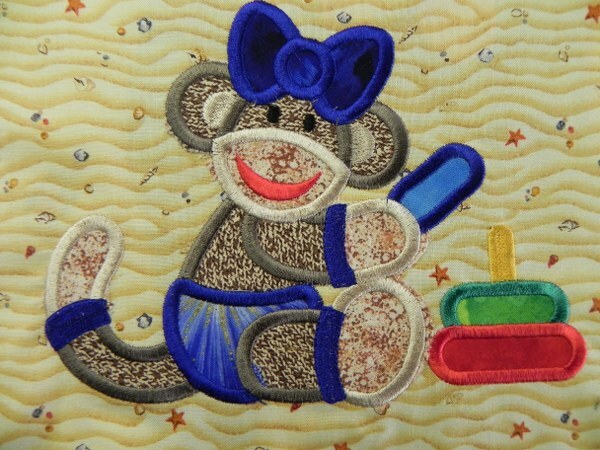 That is what you get when you decide to do a bit of digitised machine applique . However, it uses up the bits of fabric I can never quite throw away and the results are very pleasing. 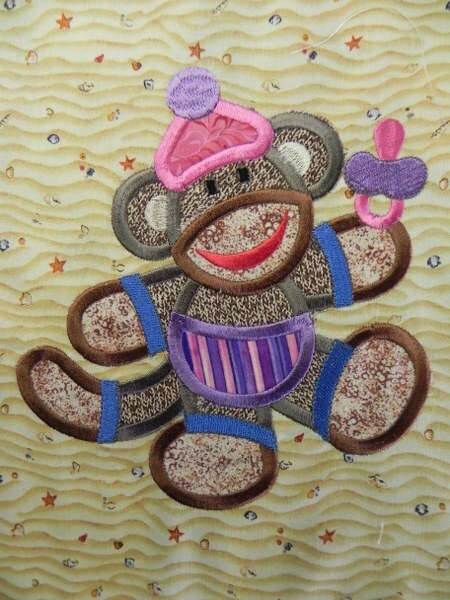 I have various collections of Sock Monkey applique designs from Designs by Juju but the first one I am trying is the jumbo baby collection. 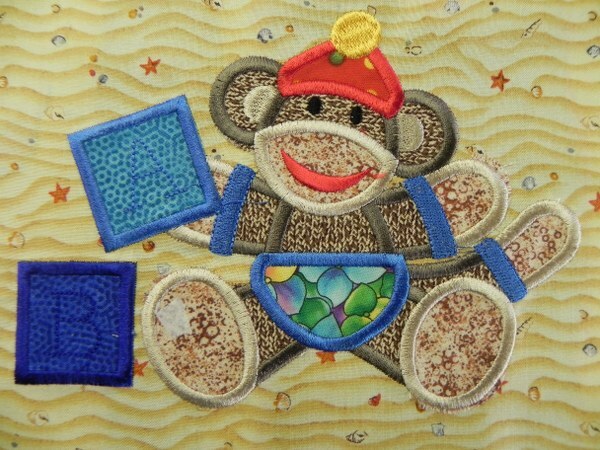 I like the fact that the Juju designs get all the fabric bits out of the way at the beginning so that once that is done the embroidery can be left to its own devices. 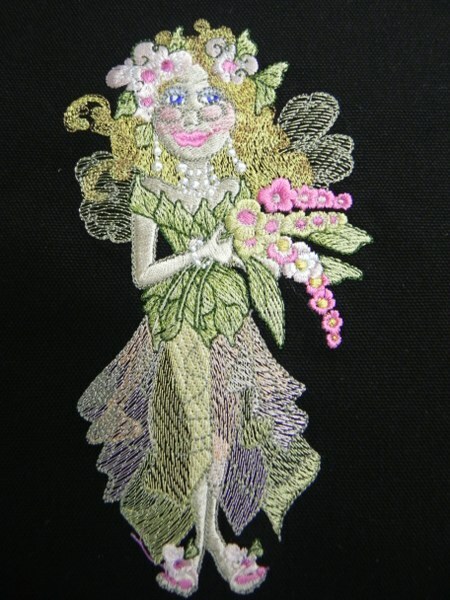 A plus if, like most embroiderers your machine only has one needle is that, because the fabric is all placed at the beginning the first 10 or so stages can all be done with the same colour in the needle which means you don’t have to keep re-threading it. 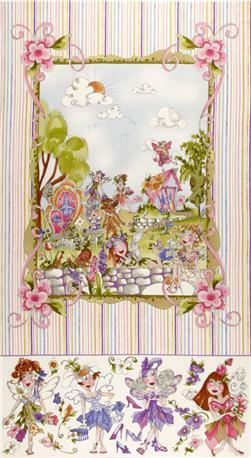 The satin stitch is digitised to do each colour in one hit too which is another plus. 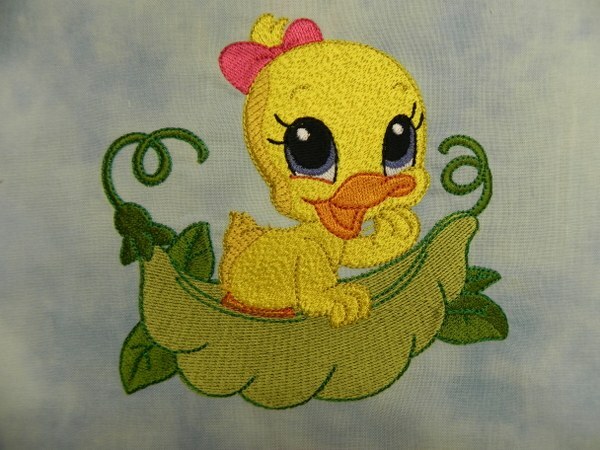 In case you have not done this type of embroidery I should explain that the reason for my sticky fingers was spray glue. 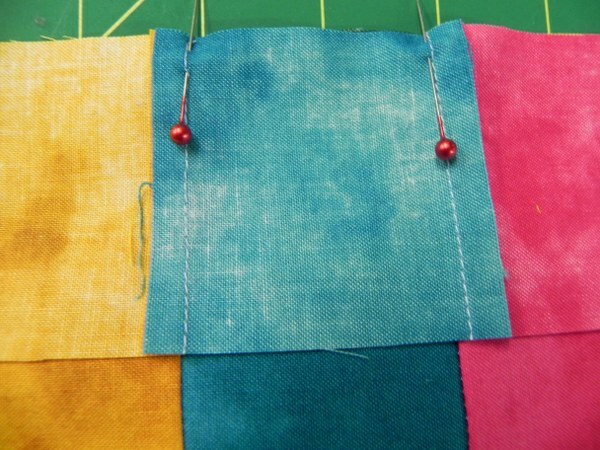 It is the easiest way to hold the scraps of fabric in place whilst the machine stitches over them. You can buy a temporary glue that stays sticky just long enough to do the job of holding the fabric in place. You can also buy a special glue stick if you don’t want gluey surfaces. Lots of paper on surfaces and spraying well away from any machinery are also to be recommended. 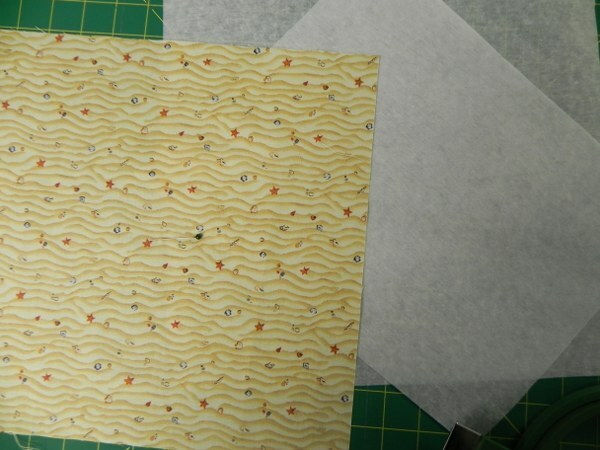 I spread A3 sheets of paper over the table on which I am going to do the glueing. 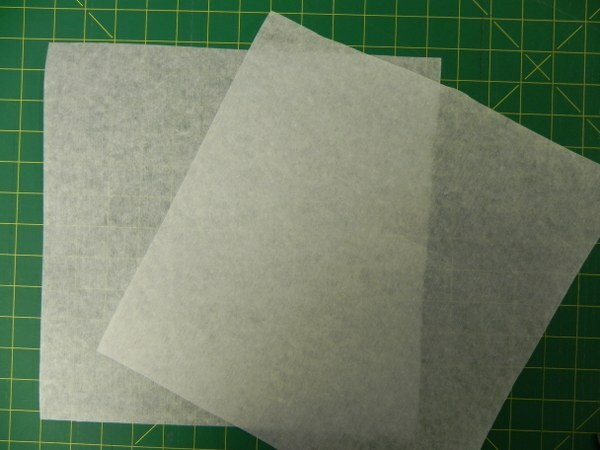 This has the added advantage that no wiping is required and the paper can be folded up and disposed of and a fresh sheet put down when it gets too sticky. Butchers paper or brown paper would also work but I would think the print on newspaper might be a problem. This is going to be a fairly basic tutorial so experts feel free to skip to the pictures. 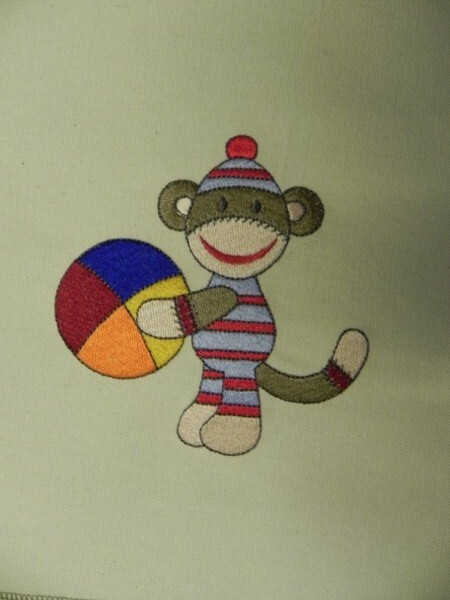 If you like the idea of the sock monkeys but not the sticky bit then Juju does straight embroideries too. Here is one of them. They are well digitised and stitch out perfectly. 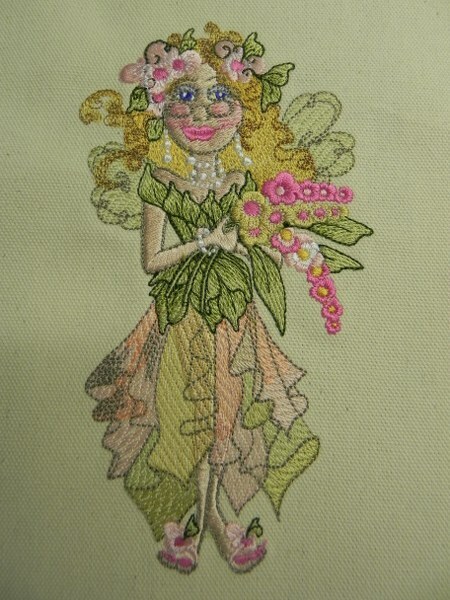 Here is a link to some of the embroideries. 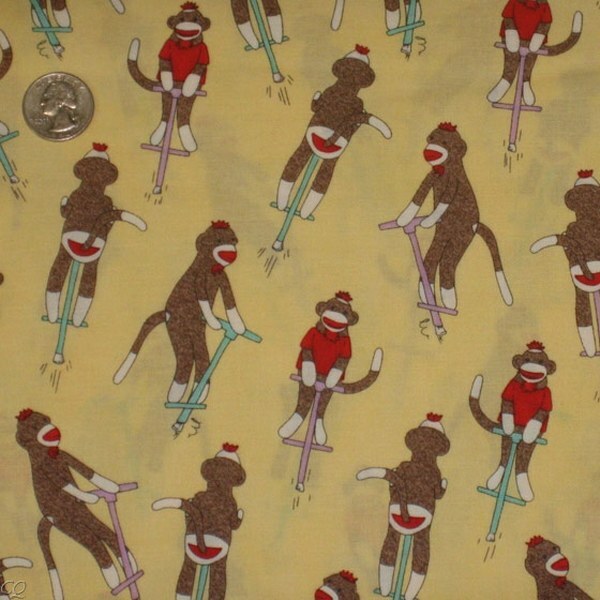 Otherwise just put ‘sock monkeys’ in the search on the home page and there are a raft of them. Back to the applique. The designs come in different sizes, usually two different ones with each download. 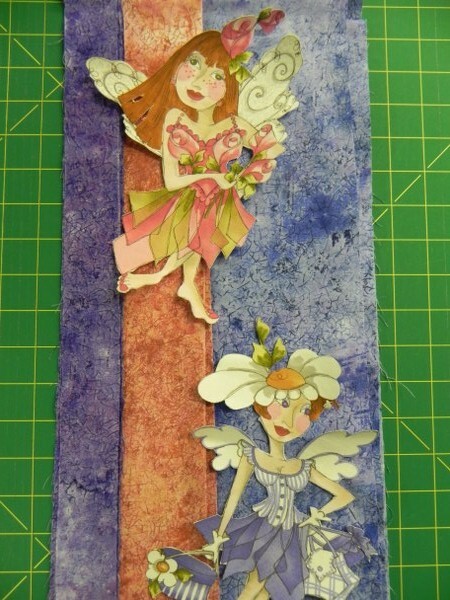 For this tutorial I am using the ‘Jumbo’ designs that come in 6″ x 10″ and 8″ x 8″. I am using 8″ x 8″ as it ends up the largest and if I’m doing jumbo I might as well go the whole hog. First I downloaded each design onto the software on my computer and sent it to the machine. 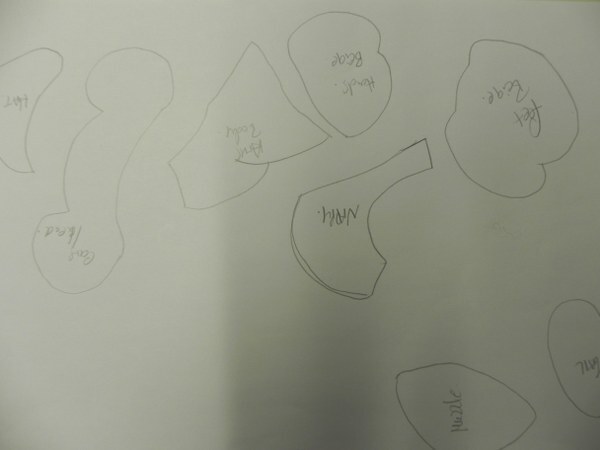 I then called up the design sheet which prints out the actual size of the finished design. This allows me to use it as a template from which to trace all the relevant pieces for the design. I have a light box which makes life easier. 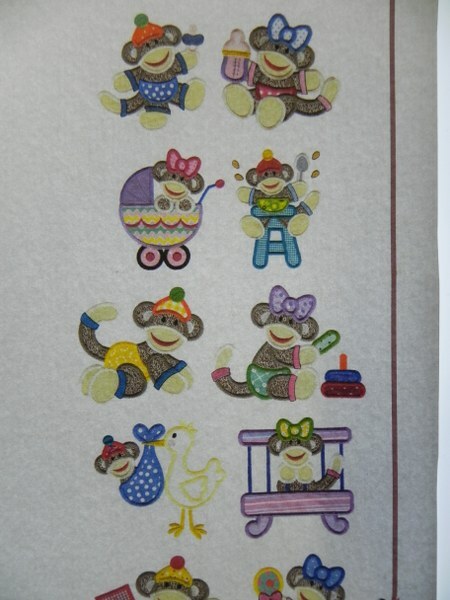 The colour charts that come with the designs only show the stitching so I found it useful to print off the pictures of the finished appliques from the web site so that I could see where fabric was needed. 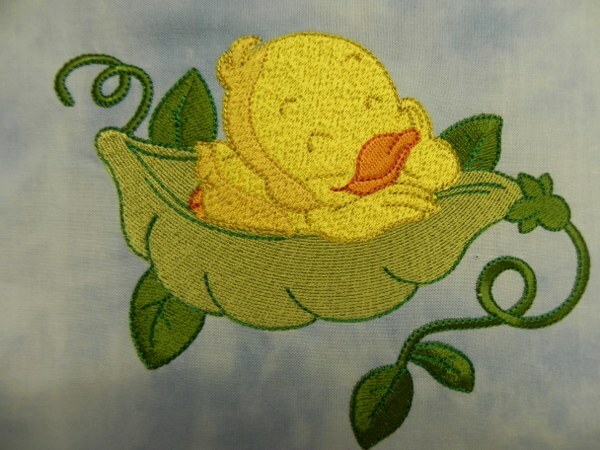 Digitised appliques start with a line stitched round the area where the first piece of fabric is to be laid down. 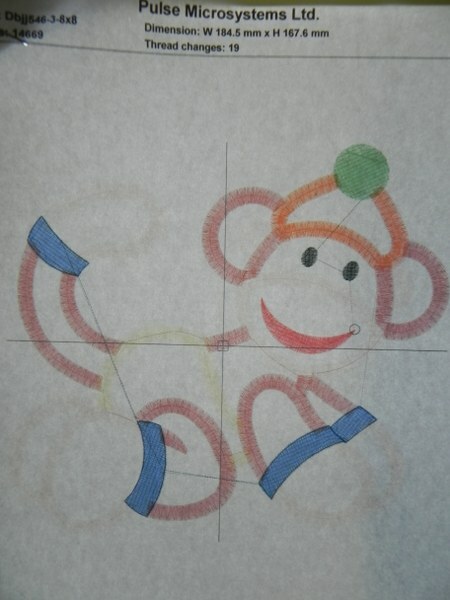 This line is visible on the pattern printout so I used this to trace the shape of the pieces to be cut from fabric. 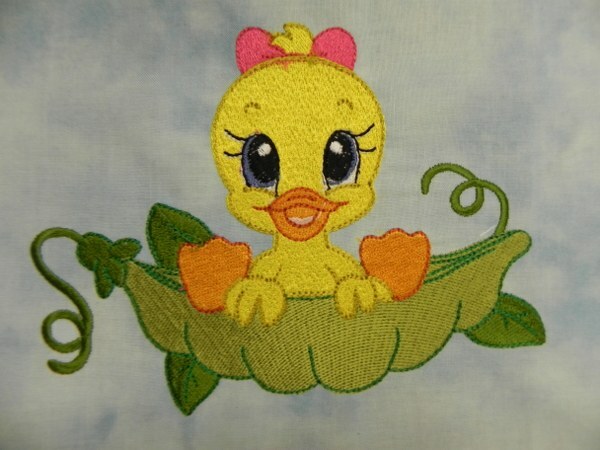 I traced each piece and cut it out close to the line but making sure there was enough to be caught under the satin stitch when it was stitched. 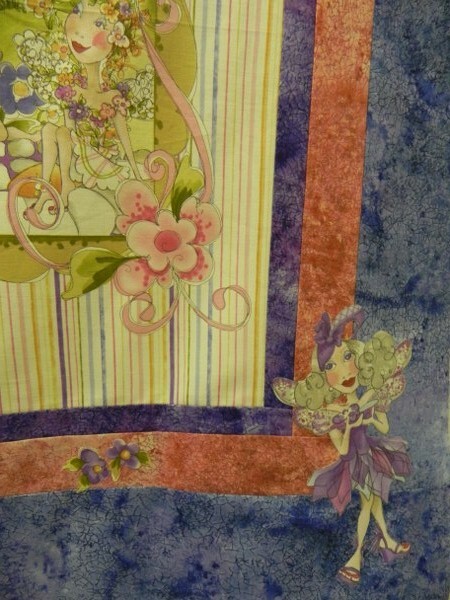 These designs have a nice wide stitch which helps. 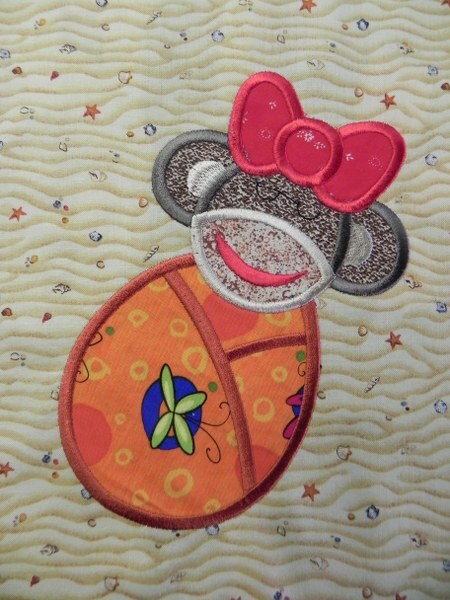 Always use stabiliser under the fabric. 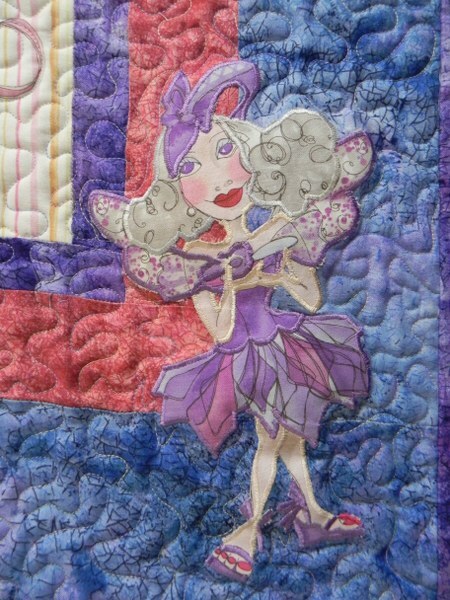 I used two layers of medium weight tearaway stabiliser and hooped it with the fabric and the designs stitched perfectly on patchwork weight cotton fabric. Before hooping I find the centre of the fabric so that it can be centred on the machine. If you cannot choose where the hoop sits on your machine you have at least some indication of where the centre is so that you can get it as near the correct position as possible whilst hooping.. You can of course just use a very large piece of fabric but that’s a bit extravagant, fabric prices being what they are these days. I marked it with a pin but unless you want to damage the needle if not the machine, remember to remove it before setting the machine going. You could use a faint pencil or fading marker mark instead if you do not like living dangerously. The design first stitches a line to show where the first piece of fabric goes. Cut the piece slightly bigger than the template traced from the design printout. 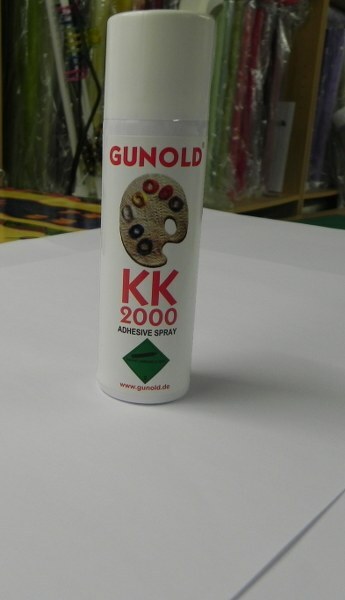 Spray with temporary spray glue to hold it in place and press gently on to the marked area. The second stage then tacks it down. 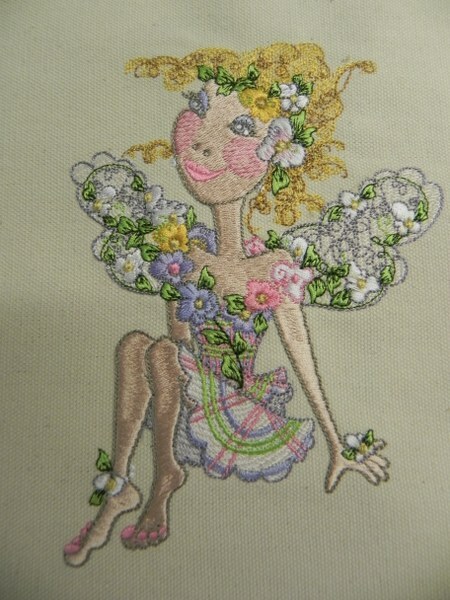 With these designs this is repeated until all the fabric is tacked down ready for the satin stitch. 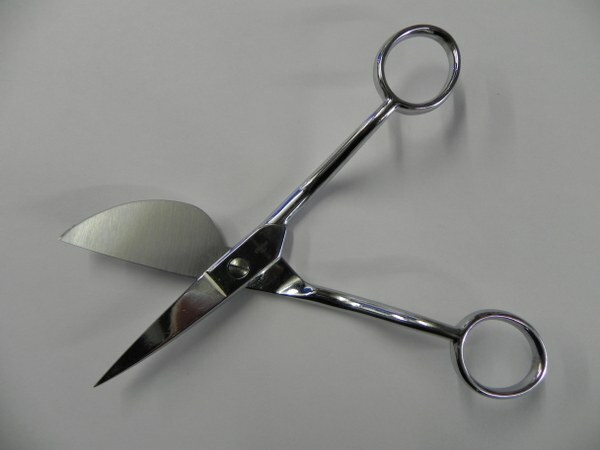 If you need to trim the fabric use a pair of very sharp scissors. If you do the trimming as each piece is added you just need to trim it close the the line. 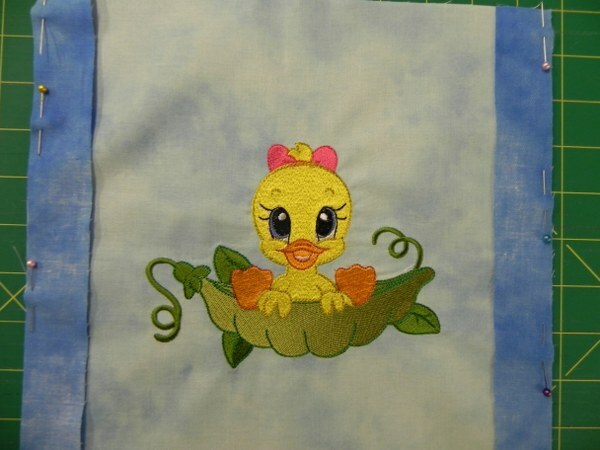 If you wait until the end you risk cutting the satin stitch. 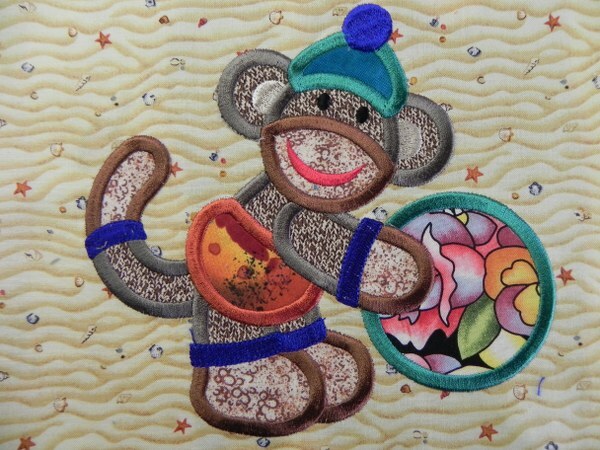 You really don’t want to do that after all the work you have put into the embroidery, especially if you have a single needle machine and have had to rethread the needle many times.It is worth investing in a pair of special applique scissors. 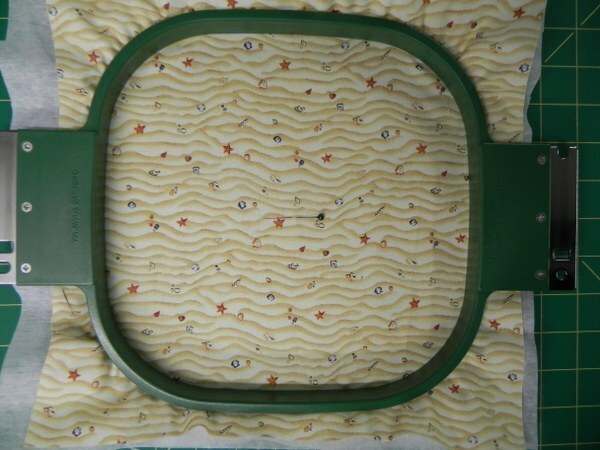 They have one blade shaped like a pelican’s beak that keeps the blades away from the stitching and makes life easier. I bought good ones which were expensive but definitely worth it. Quality shows in this sort of tool. 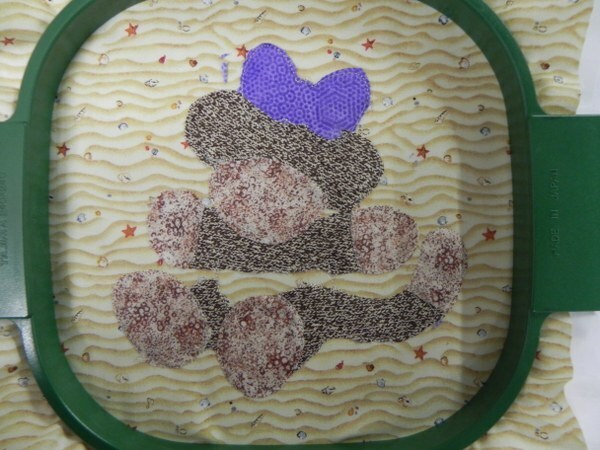 If you remove the hoop to add the pieces of fabric try not to move the base fabric as you need it to be in exactly the same place when returned to the machine. 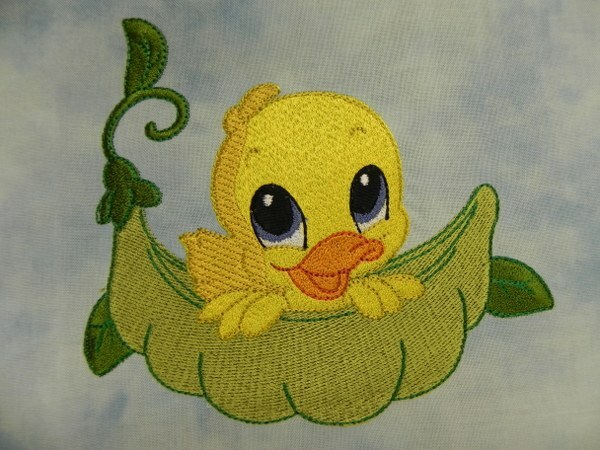 The satin stitch then finishes the design off. The stabiliser then has to be removed from the back of the embroidery if you have used tearaway stabiliser. 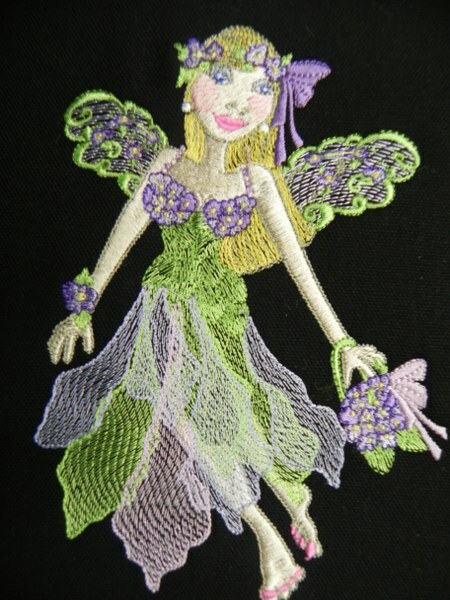 You can use cutaway stabiliser that is trimmed and left in place after the embroidery has been done. 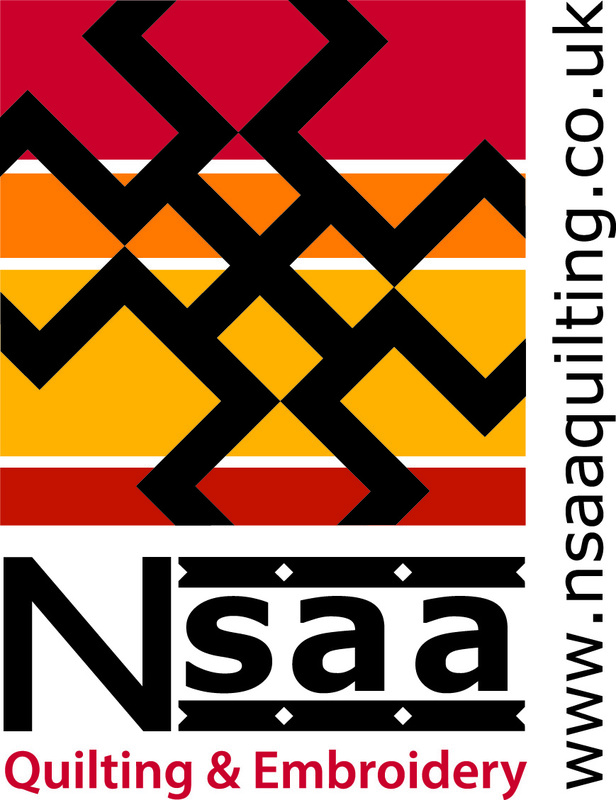 I have never used this type but it is found on the back of embroideries done on polo shirts, presumably to stabilise the stretch fabric. The jump stitches need to be trimmed from the embroidery and if you are a perfectionist you should also trim all the loose threads from the back. Jump stitches are the threads left when the machine moves from one area to another without cutting the thread. 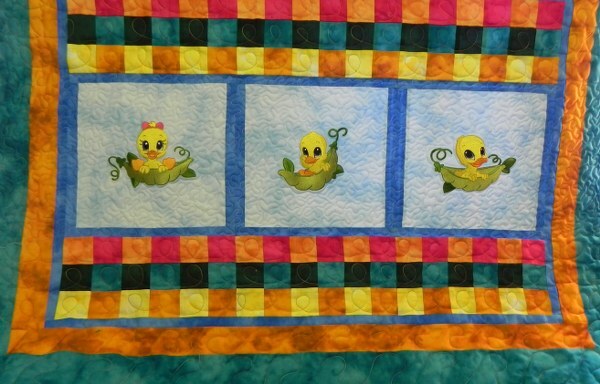 Here are some appliques I prepared earlier. 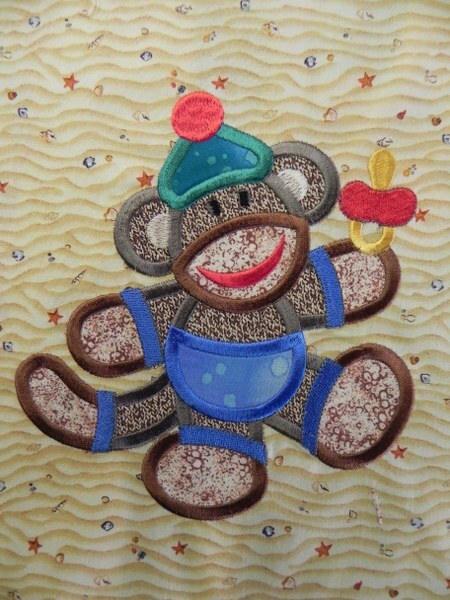 Although it is a bit more work -and leads to very sticky fingers I like applique. 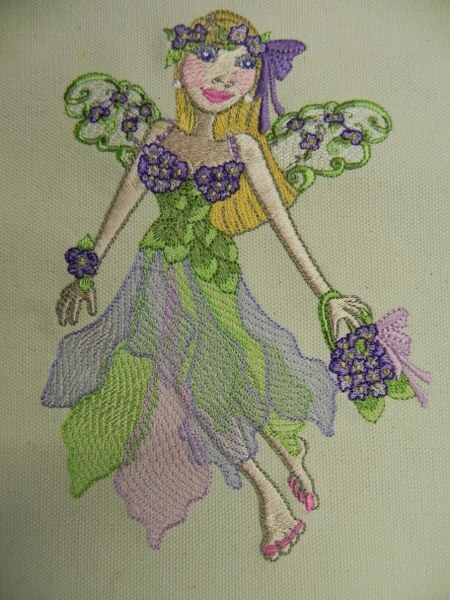 With an embroidery you can vary the colour but little else. 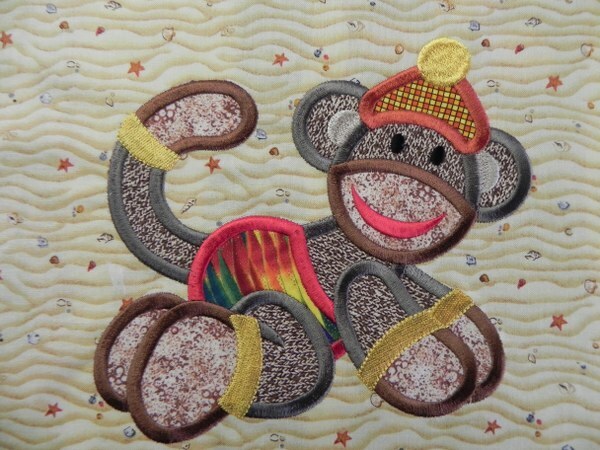 With applique using different fabrics makes them your own. 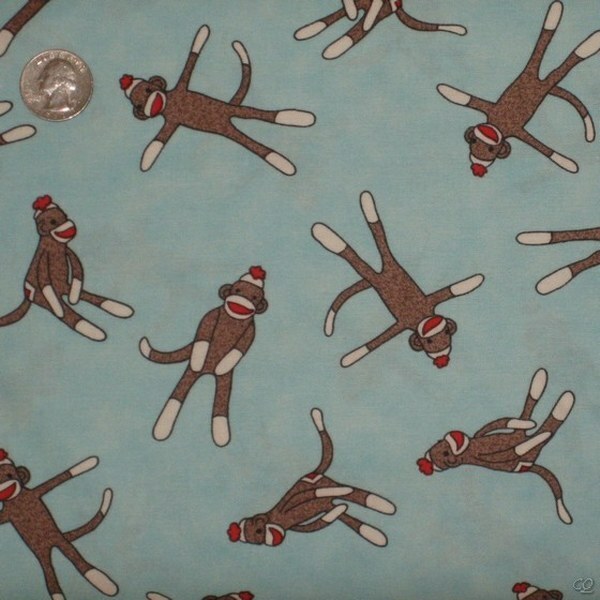 If you want to use the sock monkey fabric that I used I couldn’t find any in the UK so had to import it. 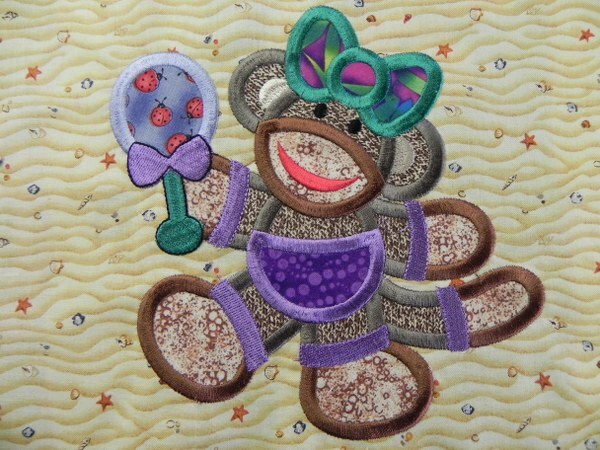 I found it at Christa Quilts in Las Vegas. The added advantage for UK residents is that she charges a flat fee for posting overseas. Watch out for the VAT though as that adds 20% plus a contribution to the Post Office coffers and delays the parcel. 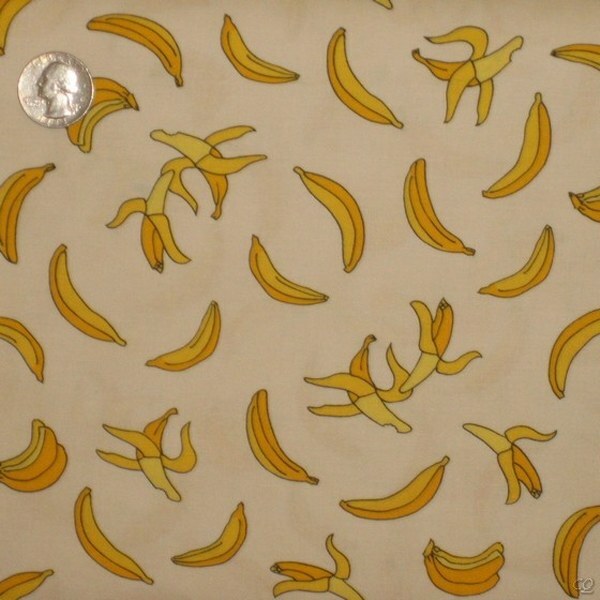 Worth it for must have fabric that is unavailable here though especially if you get it on one of her 20% off sales as I did. 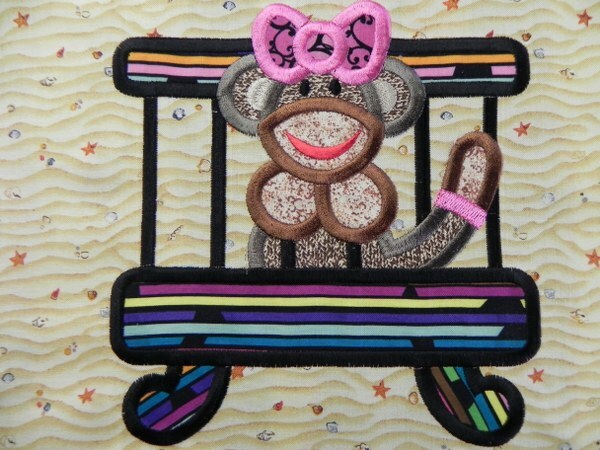 I can’t decide whether to make one large quilt or two small ones but on balance I think maybe small ones will be best with this baby theme. Watch this space. Getting All Your Ducks In A Row. 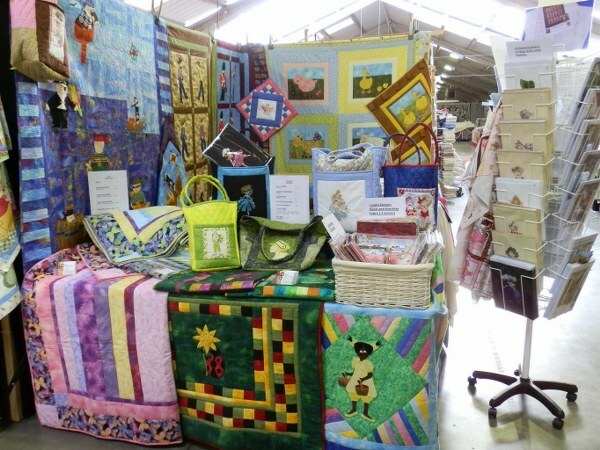 I was trawling the internet mainly to see where links to my blog had come from when I came across yet more inspiration from a fellow crafter. 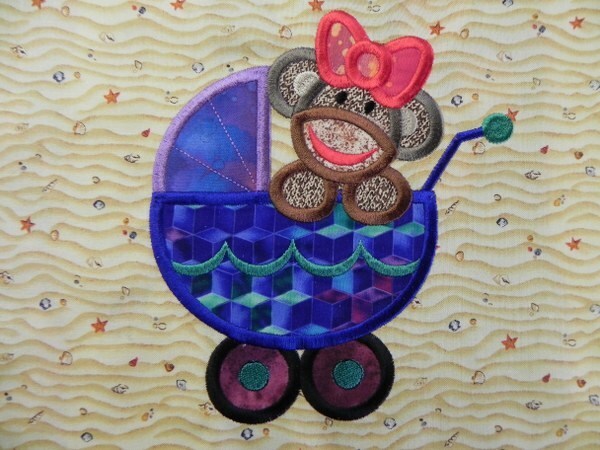 Vicki’s Fabric Creations had a blog on a quilt made from embroideries by Embroidery Connection. 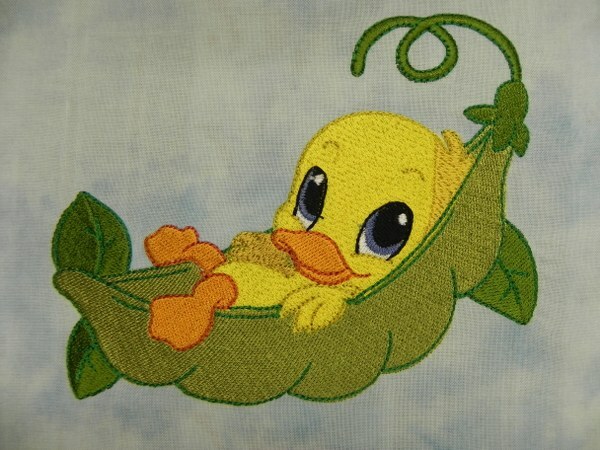 They are called ‘Sweet Pea Duckies’ and are irresistible to anyone who likes ‘cute’. 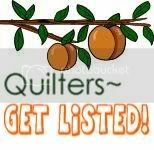 As I believe in sharing here is a link to the page in case you would like to try them too. 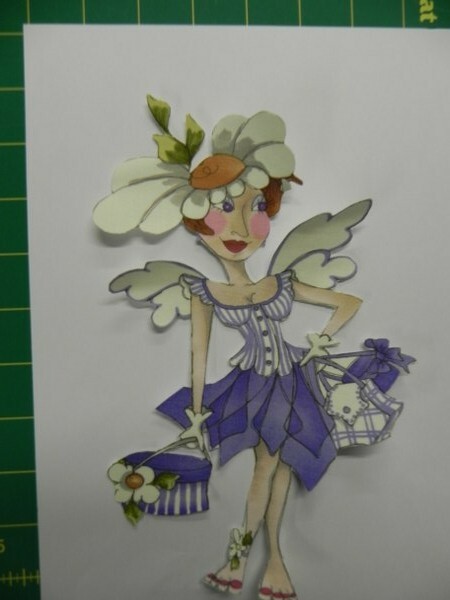 In this blog I will show you what I produced and how. If you are not keen on the colours ignore them. The originals are digitised in Marathon threads and I use Madeira so they are largely my interpretation with a bit of help from a thread comparison program. I have never yet found one of those that is accurate. 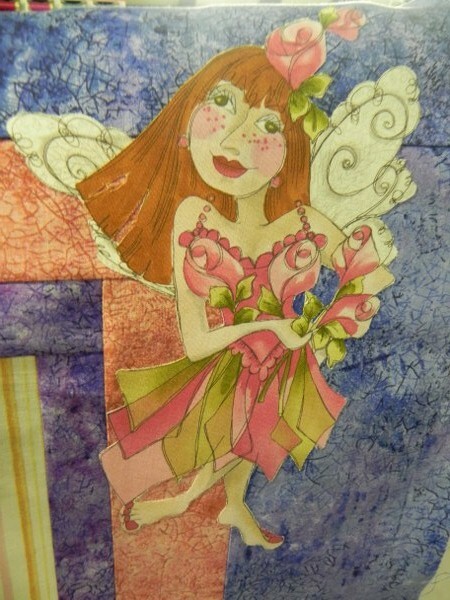 I also did them on normal patchwork fabric and they didn’t pucker – not always easy to achieve. There are ten of them. Have a look at the links for the rest. I had a bit of a problem in that I was supplied with the wrong colour charts but a quick email put that right, which is perhaps all you can ask. I only mention it in case you might have the same problem and need to know how to solve it. 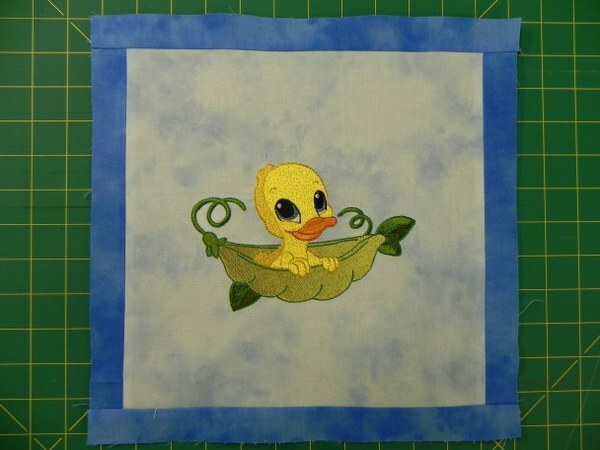 I always use a piece of fabric bigger than the required block size as embroidering and pressing often distort the block from perfectly square. I then trim the block to size with my trusty cutter/ruler which is a bit easier than a pair of scissors and a lot safer than a separate ruler and rotary cutter. Being accident prone I was very pleased to find these on an Australian visit and I have found a source in the UK after much trawling of the internet and I now have some spares in case they disappear again. I looked for a couple of years and finally found them by accident. It is amazing how difficult it is to find things on some websites even if you know they are there and I didn’t know where to start. 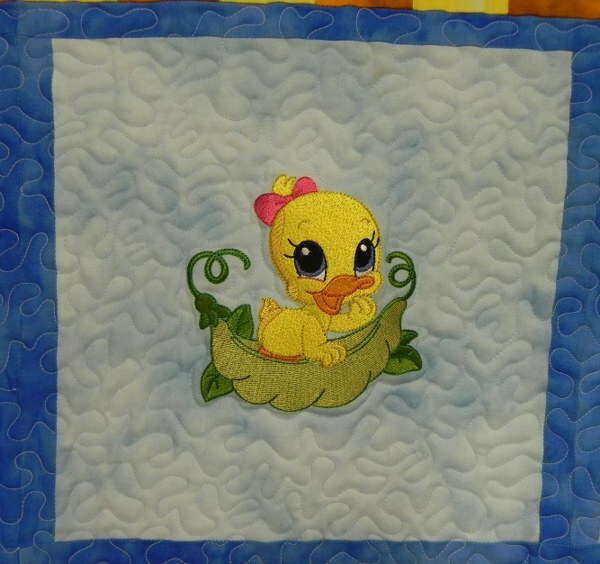 My first mistake was changing the style of quilt after I had already finished the embroideries. This meant that I had 11″ blocks when what I now needed was 12.5″ blocks. I got over this by adding a frame, taking the final size of each block to 12.5″. 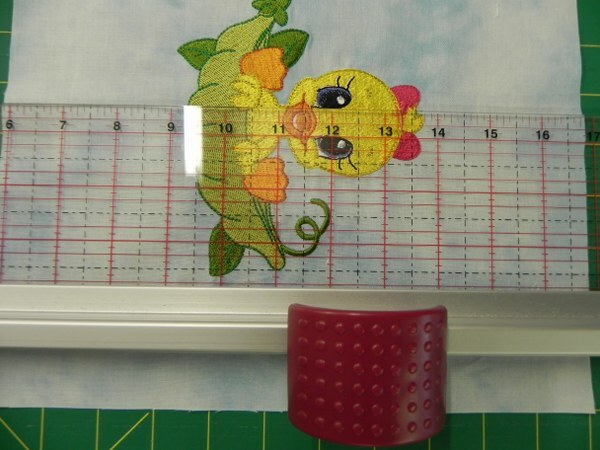 I needed an extra 1.5″ total which equates to 3/4″ (0.75″) on each side plus seam allowances of an extra 1/2″ (0.5″) each making each strip 1.25″. Just don’t forget the seam allowances and don’t panic. There is usually a way and If not you change the design yet again. It is rarely an unmitigated disaster. 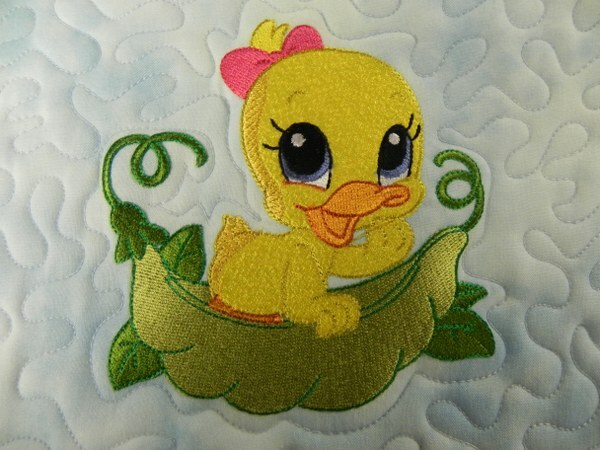 Pin and sew them in place with the usual 1/4″ seam. The sides will be 11″ each and top and bottom 12.5″. However, do not assume this, always measure at each stage. Seams are not always accurate. 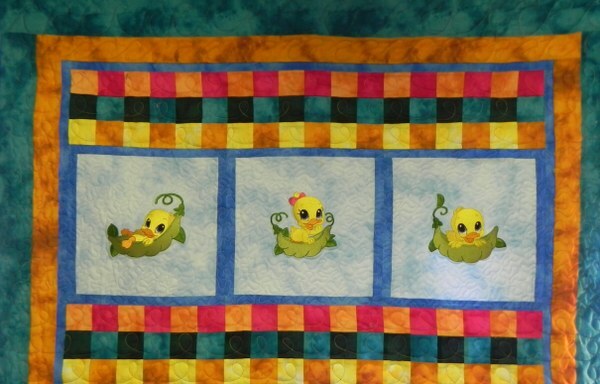 The ducks are sewn together in threes across giving two rows of three so we need something to join the rows together. 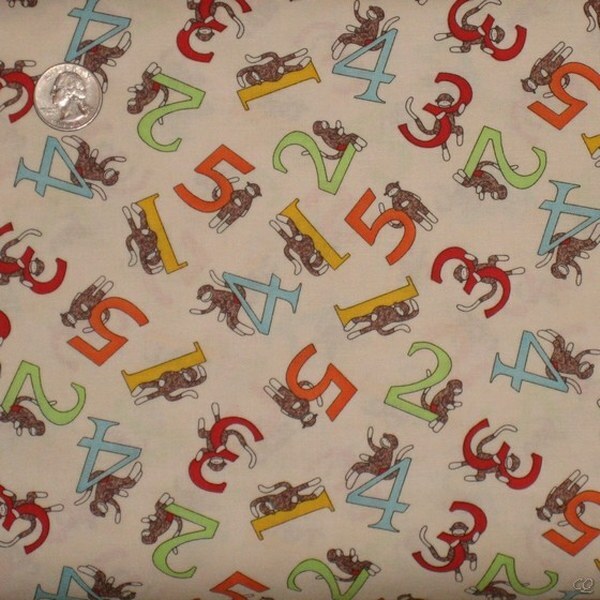 I used 2″ squares. 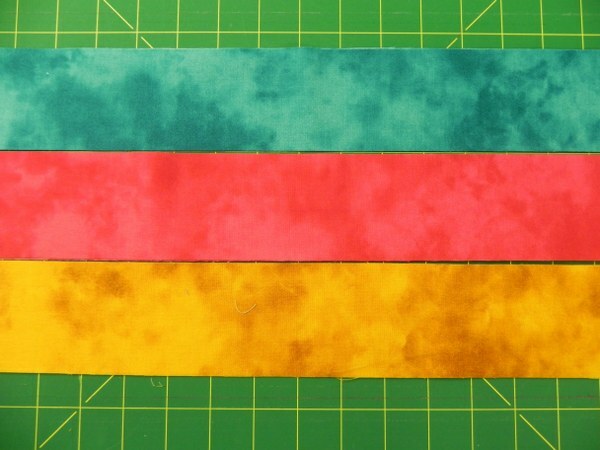 To achieve this you need to cut 6 different strips each 2.5″ wide. I needed to cut two of each for the complete quilt. Three of the coloured strips. 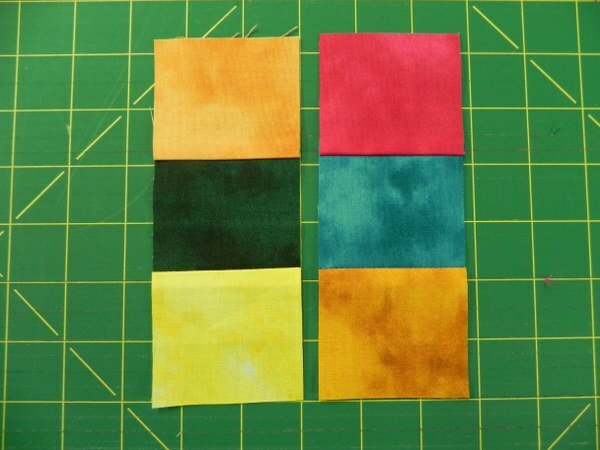 Join three together twice then cut into 2.5″ strips again. 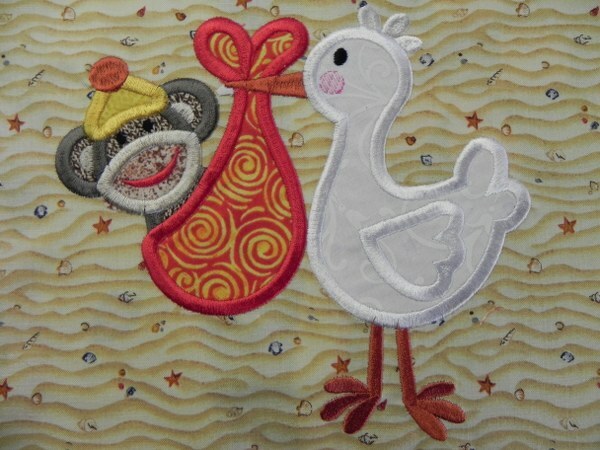 I chose some colours from the duck embroideries to draw together the borders and the embroideries. Yes the colours are the same but I don’t exactly have studio conditions for my photographs. 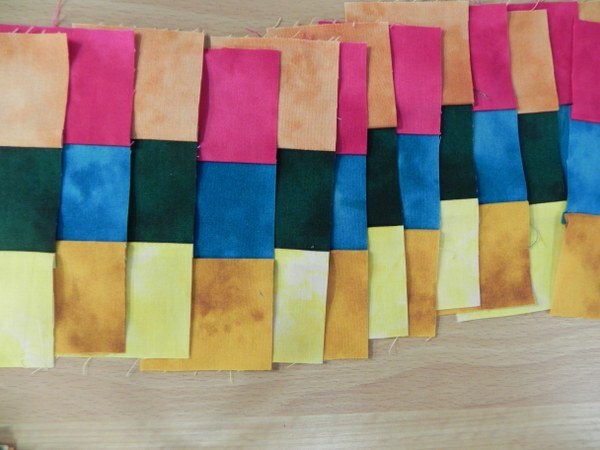 Join together 18 of the strips, alternating the colours and using a pin to keep the seams aligned until sewn. 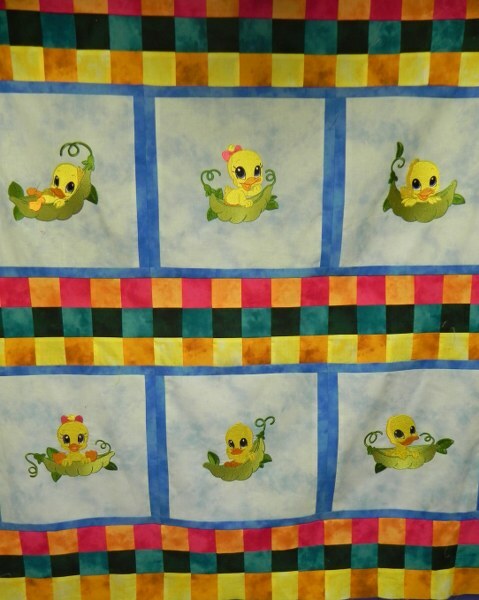 The rows of ducks are then enclosed in the three sections of squares. 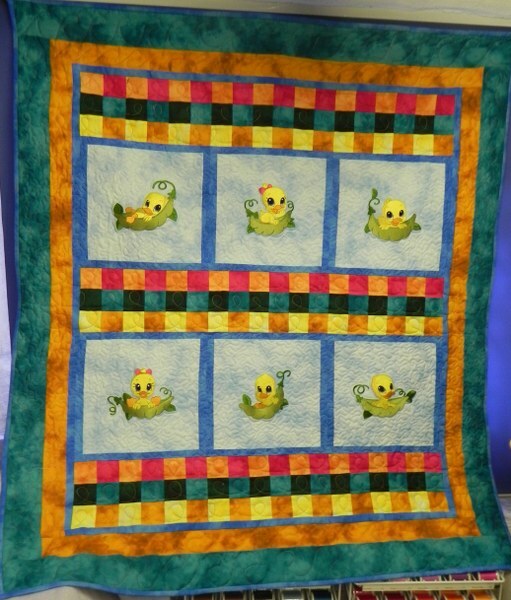 I decided that the next border should be the same blue and the same width as the sashing round the ducks, again to bring the bits of the quilt together. Makes it a bit easier on the eye. 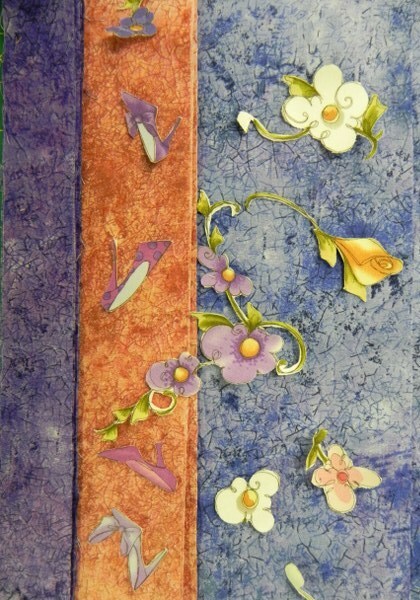 I then did different sized borders using other colours from the squares. There are Fairies at the Bottom of my Stash Box. 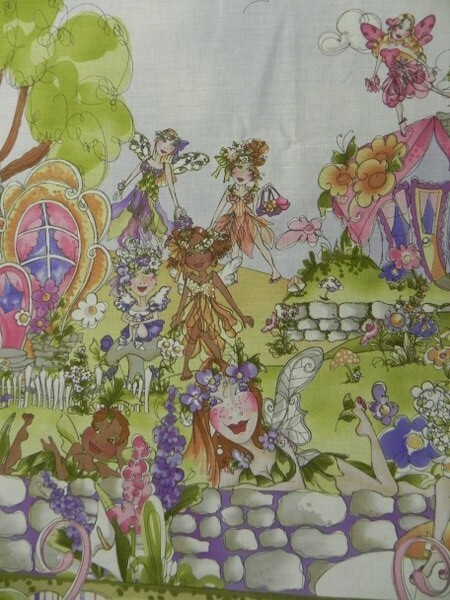 Being a bit of an afficionado of Loralie Designs, when I saw some of her ‘Very Fairy’ panels on sale at a discount I had to have some. Then I couldn’t decide what to do with them so they were put away with the other UFO’s. This week I finally had another look and decided that I must make something with them. I am not a fan of framing a panel and leaving it at that, it seems a bit like cheating so I had to do a bit more. As you can see, the basic panel comes with four figures at the bottom. 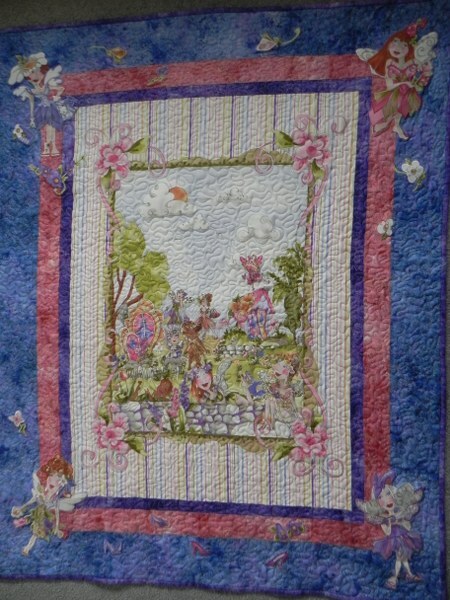 I cut those off and all the little flowers and shoes and appliqued them on after I had stitched borders round the central panel. 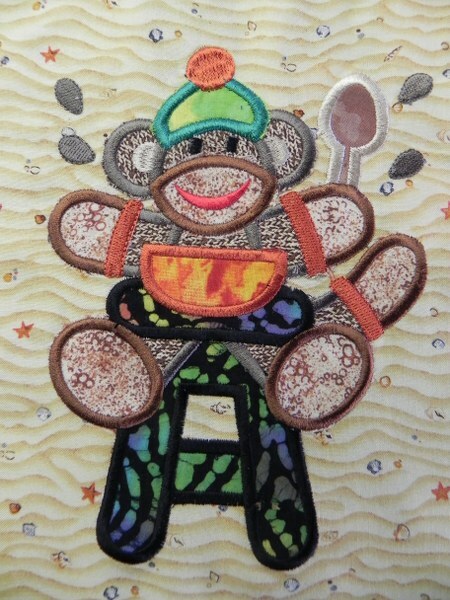 Cut round the figures for applique. 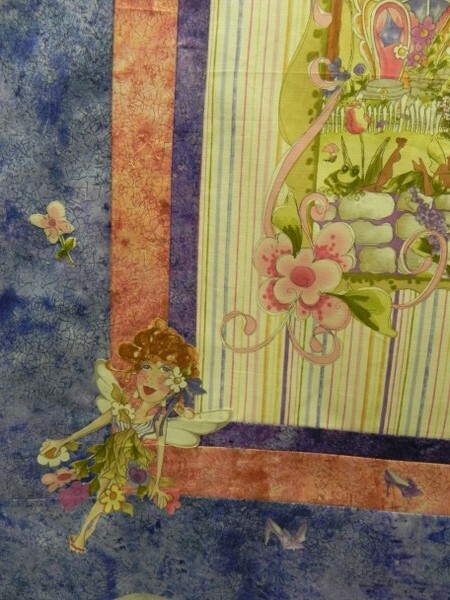 Fix to corners with fusible web after the borders have been applied. Satin stitch around the edges in matching colours. A bit of a session on the quilt frame and ‘Hey Presto’. 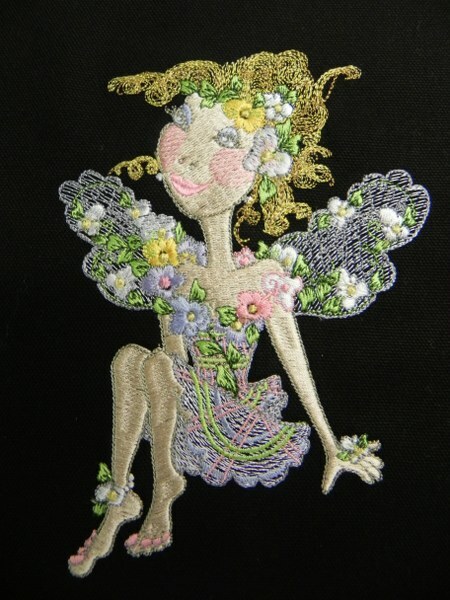 I rather took a shine to the Very Fairy l embroideries too so I did a few of those. 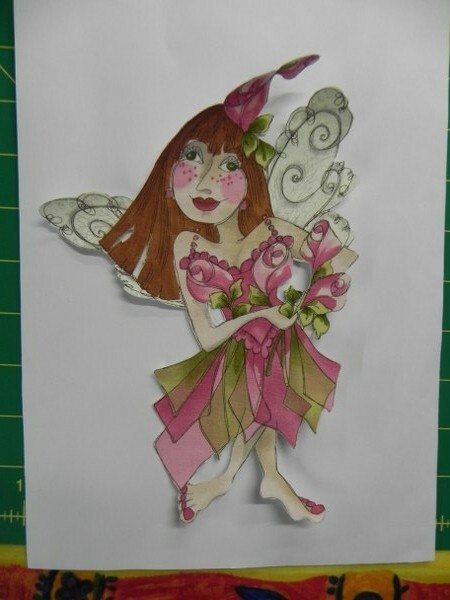 If you want one and can’t be bothered to do it yourself have a look at my web site on the Loralie Fairy page. More to be added in the coming days. They take a while but I think they are worth it.